PHOENIX, AZ., February 29, 2016 – KEO Marketing (www.keomarketing.com), a full-service business-to-business (B2B) marketing agency, has announced that the Human Rights Campaign has renamed its Arizona Individual Equality Award in Sheila Kloefkorn’s honor. Going forward, the award will be known as “The Sheila Kloefkorn Individual Equality Award.” Kloefkorn is founder and president of KEO Marketing. As the largest national lesbian, gay, bisexual and transgender (LGBT) civil rights organization, HRC envisions an America where LGBT people are ensured of their basic equal rights at home, at work and in the community. The organization represents a force of more than 1.5 million members and supporters nationwide. Working at the local level, Hrc Arizona fights for LGBT equality alongside state and local groups and lawmakers. The award was be unveiled at the 12th Annual HRC Arizona Gala Dinner on Saturday, February 27, 2016 at the Sheraton Phoenix Downtown Hotel. 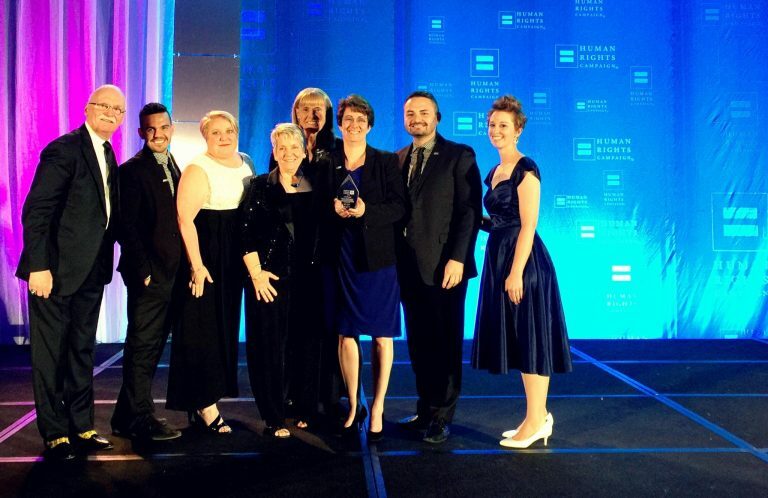 The HRC Arizona Gala recognizes organizations and individuals who have supported the Human Rights Campaign. Michael Sam, who made history as America’s first openly gay professional football player, was the keynote for the event. This year, HRC Arizona honored both Maria DeNicola and Dr. Toby Meltzer with Sheila Kloefkorn Individual Equality Awards. Maria DeNicola is a certified electrologist. Over the past 30 years, Maria has been a lifeline for many transgender individuals in Phoenix. Practicing medicine in Scottsdale since 2003, Dr. Toby Meltzer has also helped transgender individuals from all over the world take the medical steps to transition. A marketing expert with more than 25 years of experience, Kloefkorn is deeply committed to creating jobs and growing Arizona’s economy and its communities. In addition to her business leadership, she has dedicated her life’s work to building a more equitable world. Kloefkorn served on the National Board of Directors of HRC for 6 years and has volunteered for the local steering committee for more than a decade. She was active on the ONE Community Multicultural Advisory Board and co-chaired the “Yes on Prop 475” ballot initiative to extend non-discrimination protections to Tempe citizens through the city charter. Kloefkorn has raised hundreds of thousands of dollars in support of equality causes nationally and locally. In 2012, Kloefkorn was honored at the Human Rights Campaign Equality Convention with the prestigious National Leader of the Year award. In addition to this award, she was honored in 2011 with the Local Hero Award at the ONE Community Spotlight on Success. She was recently named one of the “Top 10 Business Leaders of the Year” and “Top 25 Dynamic Women in Business” by the Phoenix Business Journal and one of 15 Arizonans to Watch by the Arizona Republic. She also received a Stevie Worldwide Women in Business Award for her work in Advertising and Public Relations. Kloefkorn is a frequent national and local speaker on a wide variety of marketing, business, diversity and inclusion topics. To learn more about the 2016 Gala, visit the event website at hrcazdinner.org. For more information on HRC Arizona, visit http://www.hrc.org/local-issues/arizona. KEO Marketing is a leading business to business (B2B) marketing agency. KEO Marketing creates and implements innovative strategies to help clients dramatically increase leads and sales. The company’s solutions include marketing strategy, brand positioning and messaging, inbound marketing, content marketing, search engine marketing and optimization, social media, website development, advertising, local and mobile marketing and more. Some of the world’s largest brands have depended on KEO Marketing for marketing that delivers tangible and substantial results. For more information, visit www.keomarketing.com.